Platted in 1905 by George Lamport and Robert Leavens, Bearcreek was the center of an extensive underground coal mining district. At its height during World War I, Bearcreek boasted a population of nearly 2,000 people. The community was ethnically diverse and included Serbians, Scotsmen, Montenegrans, Germans, Italians and Americans. They were served by seven mercantiles, a bank, two hotels, two billiard halls, a brickyard, and numerous saloons. The town also boasted concrete sidewalks and an extensive water system. No church was ever built in Bearcreek. Foundations of many of the towns buildings, in addition to some structures themselves, consisted of sandstone quarried in the nearby hill. The local railway, the Montana Wyoming and Southern, carried coal from the mines through Bearcreek where it was distributed to communities across Montana. The Lamport Hotel was once located on the foundation to the right of this marker. Built in 1907, it was described as well furnished the beds being especially soft and sleep producing. [The] meals are served with a desire to please the guests and no one leaves without a good impression and kindly feelings for the management. The hotel was razed about 1945. In 1943, Montanas worst coal mining disaster at the nearby Smith mine took the lives of 74 men, many of whom lived in Bearcreek.The tragedy hastened the decline of the town. Many buildings in Bearcreek were moved to other communities or demolished, leaving haunting reminders of their presence along Main Street. The railroad tracks were removed in 1953 and the last mining operation closed in the 1970s. 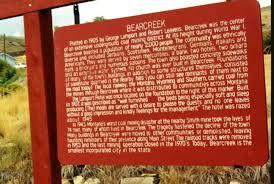 Today, Bearcreek is the smallest incorporated city in the state.